by J. G. Thompson Jr. I first heard of Jim Thompson in the pages of Ted Annemann's Jinx . Then his main interest was mental magic. I have never seen him perform but I have seen many magicians use the tricks he has put into print. I always visualize him as a mild mannered man who would make an excellent beacon in a blackout. See his "Moonlight Madness," page 301 in Annemann's Practical Mental Effects , or page 265 in My Best . 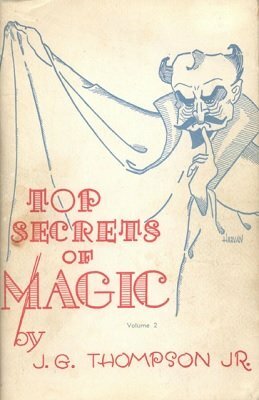 This current volume of "Top Secrets" is the second in a planned trilogy. You have most of the objects needed for the feats described. If something special is required, Jim will tell you how to make it, or where to buy it. Coins, cards, rings, matches, rope and paper play a prominent part in the ages that follow. There is a puppet sequence with a character named "Jocko" that should appeal to youngsters and, for more mature audiences, Jim gives his thoughts as to how a mindreading act should be routined and staged. Actually, encouraged by the reception given Volume 1 , I was busily engaged, as early as 1957, in putting together the material you'll find here. Then there was a lull (the kindest phrase I can think of!) that stopped me from applying the finishing touches until 1960. It was followed by a storm that lasted about five years. So ... now you know! 1st edition 1967, 120 pages; PDF 147 pages.